Location: Spofforth, North Yorkshire, England. Notes: Spofforth Castle in the village of Spofforth, North Yorkshire, England was a fortified manor house, ruined during the English Civil War and now run by English Heritage as a tourist attraction. 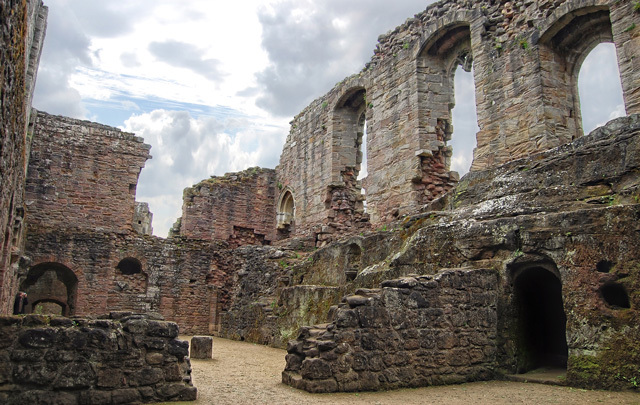 Spofforth Castle was built by Henry de Percy in the early 14th century when he was given a license to crenelate a manor house on the site, with later alterations made in the 14th and 15th centuries. The Percy estates, including Spofforth, were confiscated after the rebellion against King Henry IV in 1408 and given to Sir Thomas Rokeby. They were later restored and then lost again in 1461 when the Percys supported the losing side in the War of the Roses. Spofforth was eventually returned to the family and remained inhabited by their steward until 1604. The castle was reduced to ruins during the English Civil War of 1642-46. The castle was given to the Office of Works in 1924 by the Baron Leconfield. The ruins, primarily the west side of the original castle, are now listed as a grade II* listed building and under the guardianship of English Heritage as a tourist attraction. They are managed by Spofforth-with-Stockeld Parish Council.